Ouyang, H., Wang, L., Peng, W., and Deng, H. (2017). "Fungus-assisted acetic acid pre-treatment of Eucommia ulmoides Oliver seed shells for enhancement of enzymatic hydrolysis," BioRes. 12(3), 5583-5600. The potential of nine fungal strains for pre-treating Eucommia ulmoides Oliver seed shells (EUOSSs) was investigated. Phanerochaete chrysosporium Burds. was found to be the best fungal strain for pre-treating EUOSSs. After co-pre-treatment with acetic acid and P. chrysosporium Burds., which was cultivated in a solid state with an approximately 74% moisture content at 28 °C for 28 d, the weight loss of the EUOSSs was 51.9%. Because of the cooperative efficiency of the biochemical pre-treatment, an enzymatic digestibility value of 86.6% was achieved. The high digestibility value was attributed to the synergism between the acetic acid and fungal treatments, which led to improved enzymatic accessibility of the EUOSSs. As an environmentally friendly processing method, fungal pre-treatment can save a great amount of energy and, in combination with an acetic acid treatment, is more efficient at improving the rate of sugar transformation. Eucommia ulmoides Oliver—know as the Chinese rubber tree (Dù-zhòng) in China or Tuchong in Japan (Anderson 1982; Wang et al. 2003; Ji and Su 2006)—is used extensively as a commercial plant in China (Yao et al. 2012; Pan et al. 2014; Niu et al. 2016). In addition to its leaves and bark, E. ulmoides seeds are a major product of the plant. Rich in linolenic acids and linoleic acid oil, the seed oil has a high antioxidant capacity and biological activation (Zhang et al. 2010; Wang et al. 2012). As such, it is used as a nutritious plant oil for cooking food. The seed shell is a by-product from production of oil with E. ulmoides as the raw material. In a seed oil processing plant, the E. ulmoides Oliver seed shell (EUOSS) is often neglected and usually discarded as waste. Composed of cellulose, hemicellulose, lignin, and gutta-percha, EUOSSs can be used to extract gutta-percha (EU-gum or balata), which has many applications (Ruifang 1995; Zhang et al. 2008; Dong et al. 2011). Most studies on EUOSS materials focus on gutta-percha extraction technologies (Ruifang 1995; Dong et al. 2011; Niu et al. 2016), and research into the lignocellulosic material in EUOSSs is lacking. Therefore, it is necessary to develop a technology for transforming EUOSS waste into value-added products, and designing a sustainable waste-management strategy. As a cost-effective resource, lignocellulosic material also has a great amount of potential for industrial use as chemicals and biomaterials (Saha and Cotta 2007; Peng et al. 2015; Saha et al. 2016; Bilal et al. 2017). Improving the use of lignocellulosic material is an important solution for resource, energy, and environmental problems. Although hemicellulose and cellulose can be degraded into sugars, the direct enzymatic hydrolysis method is inefficient because lignocellulosic biomass is resistant to enzyme-mediated degradation (Bak et al. 2009; Wang et al. 2012; Gui et al. 2013, 2014). There has been increasing interest in the biological pre-treatment of industrial wastes (Bak et al. 2009; Gui et al. 2014; Jin et al. 2016), and microbial degradation of lignocellulosic material has become a hot research topic. Because they consume less energy and are less damaging to the environment, biological pre-treatments, including cellulose-binding domain treatment (Hall et al. 2011) and fungal pre-treatment (Mosier et al. 2002; Mosier et al. 2005; Wyman et al. 2005), are the most environmentally friendly processing approaches. Biological pre-treatments of lignocellulosic material with rot fungi results in the degradation of lignin and some selective hemicelluloses, which increases the accessibility of cellulose during subsequent enzymatic hydrolysis and fermentation, and improves the total enzymatic hydrolysis rate (Wan and Li 2010; Shaikh et al. 2011). The excretion of ligninolytic enzymes, including laccase, manganese peroxidase, and lignin peroxidase, also contributes to fungal-mediated deligniﬁcation (Wan and Li 2012; Asgher et al. 2016); therefore, fungal pre-treatment has received increasing attention over the past few years (Martinez et al. 2009; Saha et al. 2016). Nevertheless, fungal pre-treatment is accompanied by two intrinsic disadvantages: a long residence time and low degradation efficiency (Dias et al. 2010; Pinto et al. 2012). Additionally, most white-rot fungi degrade lignin and polysaccharides simultaneously, but some preferentially degrade lignin (Kuhad et al. 1997; Guerra et al. 2003). In this regard, Phanerochaete chrysosporium is the most widely used white-rot fungus for lignin degradation (Bak et al. 2009; Zeng et al. 2014; Saha et al. 2016). As agricultural wastes and woody materials differ in their chemical and structural compositions, the best fungal strains and ligninolytic systems involved in the lignocellulose degradation process may differ between substrates (Li et al. 2008; Saha et al. 2016). Additionally, one oxidative product of lignin during the biological degradation process is humic acid (Hernández et al. 2001; Pozo et al. 2010), which inhibits subsequent enzymatic hydrolysis. Therefore, a sole white-rot fungal treatment is often ineffective at enhancing the enzymatic digestibility of lignocellulosic materials. However, by integrating fungi with chemical treatments, the pre-treatment time can be shortened greatly and the enzymatic digestibility can be enhanced remarkably (Rabelo et al. 2008; Zhao et al. 2008; Zhang et al. 2016). The sugar transformation rate can be increased noticeably by combining fungal and chemical pre-treatments (Ma et al. 2010; Gui et al. 2014; Li et al. 2015). For example, a sulfuric acid pre-treatment combined with a fungal pre-treatment greatly improved the enzymatic sacchariﬁcation of water hyacinth. Of these diverse chemical pre-treatment approaches, acetic acid is an alternative to sulfuric acid. It is often used to recover sugars from lignocellulosic materials at high pressures and temperatures because it is a favourable catalyst that promotes deligniﬁcation and xylan degradation during acid hydrolysis (Pan and Sano 2005; Zhao et al. 2009; Gui et al. 2014). Accordingly, the combination of fungal and acetic acid pre-treatments is a promising approach for enhancing enzymatic hydrolysis, but finding the optimal conditions for the enzymatic hydrolysis of EUOSSs requires further study. In this study, the enzymatic digestibility of EUOSSs was improved by integrating an acetic acid pre-treatment with pre-treatments with nine fungal strains. The effects of the acetic acid pre-treatment alone and the combined acetic acid and fungal pre-treatments on the extraction of sugars were comparatively evaluated following enzymatic hydrolysis of EUOSSs. After the treatments, the compositions and mass balances of the residual solids and initial materials were analysed. The EUOSSs used in this study were collected from Cili, Zhangjiajie, and Hunan provinces in China in 2015. The samples were collected, washed, oven-dried at 55 °C, and milled in a hammer mill until the particles could pass through a 4-mm diameter screen. These samples were kept in sealed plastic bags at 4 °C prior to extraction. Nine fungal strains were obtained from the China Forestry Culture Collection Centre (Beijing, China). These strains were Phanerochaete chrysosporium Burds. CFCC-6676, Phlebia acerina Peck CFCC-84674, Polyporus ciliatus Fr. CFCC-85926, Aspergillus flavus Link CFCC-84203, Sporotrichum columbiense R. Sprague CFCC-85838, Bjerkandera adusta P. Karst. CFCC-81058, Irpex lacteus Fr. CFCC-88584, Pycnoporus cinnabarinus P. Karst. CFCC- 89594, and Pycnoporus sanguineus Murrill CFCC-86183. All fungal strains were maintained in the laboratory on potato dextrose agar plates at 4 °C (Saha et al. 2016). 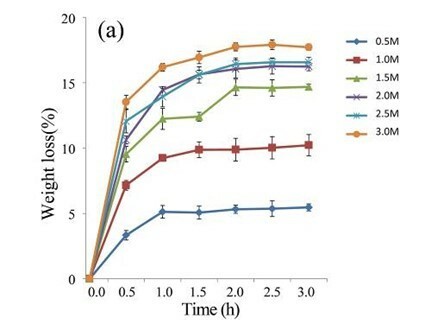 The cellulase used in this study, which was provided by Hunan Youtell Biochemical Co., Ltd. (Changsha, China), had a ﬁlter paper activity of 200 filter paper units (FPU)/g. All solvents and chemicals were of analytical grade (Hunan Chemical Reagent Co., Changsha, China), and were used as received or dried by standard procedures, unless stated otherwise. Each fungal strain was cultivated in a container of tomato juice agar, including 3 g of CaCO3, 200 mL of V-8 juice, and 20 g of agar per L, at 28 °C for 3 to 10 d. The seeds were transferred into 200 mL of a basic medium containing 10 g/L glucose, 2 g/L yeast extract, 2 g/L NaHPO4, 1 g/L NH4NO3, 0.8 g/L KH2PO4, and 0.5 g/L MgSO4•7H2O, and cultured on a rotary shaker for 1 week or 10 d at 225 rpm and 28 °C. Subsequently, the medium was adjusted to a pH of 6.0 by adding 2 M NaOH before it was sterilized. The liquid culture was homogenized under sterile conditions in a sealed tissue grinder tube for three 15 s cycles prior to inoculation. For all samples, the seed culture was normalized by removing 3 mg of cells per mL (Elisashvili et al. 2008; Zhang et al. 2010; Saha et al. 2016). The fungal pre-treatment was implemented in a 500-mL Erlenmeyer ﬂask with a foam plug. After adding 23 mL of distilled water and 10 g of EUOSSs, the ﬂask was autoclaved at 121 °C for 15 min and then inoculated with 5 mL of a fungal culture. The inoculated culture was statically incubated at 28 °C for 7, 14, 21, 28, 35, 42, and 49 d. The moisture content was maintained at approximately 74%. Non-inoculated samples were used as a control group, and they were treated under the same conditions. All experiments in this study were replicated three times (Saha et al. 2016). Based on previously optimized approaches (Wang et al. 2011; Gui et al. 2014), an acetic acid pre-treatment was performed. The EUOSS samples in the control group and those that were pre-treated with fungi were hydrolysed in 500-mL Erlenmeyer ﬂasks with 0.5 to 3 M acetic acid at various temperatures (40, 60, 80, 100, 120, and 140 °C) for 0.5 to 3.0 h. With a biomass concentration of 100 g/L, 5 mL of the acid pre-treatment (AP) was filtered, neutralized, and used for measuring the contents of the sugars and by-products. Using double-distilled water (ddH2O), the concentration of the acetate ion during AP in the control group was diluted to 0.2 M, and the pH of the AP was adjusted to 4.8 with NaOH. The APs of the EUOSSs that were pre-treated with fungi were separated into two parts. One part was ﬁltered, diluted with ddH2O, and further adjusted to pH 4.8 with solid NaOH (Gui et al. 2014). The other part was detoxified differently by diluting it with ddH2O and adjusting its pH to 4.8 with glacial acetic acid. Eventually, the prepared APs were used in enzymatic hydrolysis (Yu et al. 2011; Gui et al. 2014). The hydrolysis experiment was implemented in a covered 50-mL conical flask that contained 15 FPU/g substratum of cellulase enzyme powder, 20 mL of 50 M sodium acetate buffer (pH = 5), and 1 g of cellulosic residue (5%, w/v), and it was supplemented with Tween 80. Then, the flask was incubated at 50 °C in a rotary shaker at 150 rpm for 3 to 72 h. After filtration, the pH of the enzymatic hydrolysate was adjusted to 7 with a diluted NaOH solution, and then the enzymatic hydrolysate was used for measuring the sugar contents (Ma et al. 2010; Gui et al. 2014; Zhang et al. 2016). where cellulose is the volume of cellulose in the substratum after the chemical or fungal pre-treatments, and total sugar is the amount of sugar in the enzymatic hydrolysates after enzymatic hydrolysis. The hemicellulose, cellulose, lignin, and ash contents of the EUOSSs were verified according to National Renewable Energy Laboratory (NREL) standard analysis procedures for analysing biomass (Sluiter et al. 2008, 2012). The gutta-percha content of the EUOSSs was determined based on the analytical methods for chromic acid oxidation (Du et al. 2004; Ouyang et al. 2009; Morton 2013). All analyses were replicated twice. High-performance liquid chromatography was used to determine the galactose, arabinose, xylose, and glucose contents of the substrate (Saha and Bothast 1999; Saha and Cotta 2007). An NREL standard analysis procedure was used to estimate the total sugar yield (Sluiter et al. 2012). The EUOSSs used in this experiment were comprised of 21.55% lignin, 33.09% cellulose, 15.34% hemicellulose, and 15.25% gutta-percha in the initial dry material. The EUOSSs were then pre-treated with nine fungal strains in solid-state cultures at a moisture content of 74% and 28 °C for 1 month. Figure 1a shows the eventual weight loss of the EUOSSs that resulted from fungal-mediated decay, which ranged from 18.90% to 34.70% (Table 1). The maximum weight loss was 34.70% after pre-treatment with Phanerochaete chrysosporium Burds. CFCC-6676, which was followed by S. columbiense R. Sprague CFCC-85838 (27.84%), Polyporus ciliatus Fr. CFCC-85926 (26.89%), I. lacteus Fr. CFCC-88584 (26.23%), Pycnoporus sanguineus Murrill CFCC-86183 (26.21%), Pycnoporus cinnabarinus P. Karst. CFCC-89594 (25.55%), B. adusta P. Karst. CFCC-81058 (25.29%), Phlebia acerina Peck CFCC-84674 (25.19%), and A. flavus Link CFCC-84203 (18.90%). During the biological pre-treatment process, lignin, hemicellulose, and cellulose were used in different ratios by all nine fungal strains. As Fig. 1b revealed, the contents of lignin, hemicellulose, and cellulose in the remaining EUOSSs differed after pre-treatment with the different strains. The highest content (38.10%) was measure following pre-treatment with Phanerochaete chrysosporium Burds. CFCC-6676, which was followed by Polyporus ciliatus Fr. CFCC-85926 (30.48%), S. columbiense R. Sprague CFCC-85838 (29.45%), I. lacteus Fr. CFCC-88584 (28.38%), Phlebia acerina Peck CFCC-84674 (28.09%), Pycnoporus sanguineus Murrill CFCC-86183 (27.26%), Pycnoporus cinnabarinus P. Karst. CFCC-89594 (26.75%), B. adusta P. Karst. CFCC-81058 (26.74%), and A. flavus Link CFCC-84203 (18.05%). This data indicated that the fungal pre-treatment remarkably increased the weight loss of the EUOSSs. 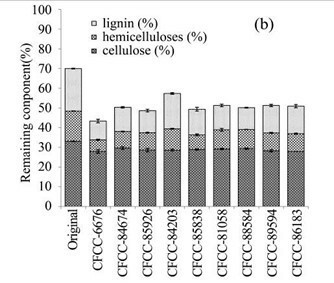 Figure 1c shows the lignin losses in the EUOSS samples that were pre-treated with the nine fungal strains. The largest lignin loss (55.91%) occurred after pre-treatment with Phanerochaete chrysosporium Burds. CFCC-6676 (Table 1), which was followed by I. lacteus Fr. CFCC-88584 (48.83 %), Polyporus ciliatus Fr. CFCC-85926 (47.96%), Phlebia acerina Peck CFCC-84674 (43.09%), B. adusta P. Karst. CFCC-81058 (42.57%), S. columbiense R. Sprague CFCC-85838 (39.61%), Pycnoporus cinnabarinus P. Karst. CFCC-89594 (35.36%), Pycnoporus sanguineus Murrill CFCC-86183 (35.16%), and A. flavus Link CFCC-84203 (16.84%). Figure 1d shows the weight loss of hemicellulose in the EUOSS samples that were pre-treated with the nine fungal strains. The hemicellulose loss was greater than 50% after treatment with two of the fungal strains; the highest weight loss occurred after pre-treatment with Phanerochaete chrysosporium Burds. CFCC-6676 (61.58%), and the second highest occurred for S. columbiense R. Sprague CFCC-85838 (51.35%). Additionally, four strains (Phlebia acerina Peck CFCC-84674, Polyporus ciliatus Fr. CFCC-85926, Pycnoporus sanguineus Murrill CFCC-86183, and Pycnoporus cinnabarinus CFCC-89594) resulted in a 40% to 50% hemicellulose mass loss, while two strains (B. adusta P. Karst. CFCC-81058 and I. lacteus Fr. CFCC-88584) caused hemicellulose mass losses of 30% to 40%. The hemicellulose loss was less than 30% for A. flavus Link CFCC-84203 (Table1). Figure 1e shows the cellulose losses in the EUOSS samples that were pre-treated with the nine fungal strains. The highest cellulose loss (Table 1) occurred after pre-treatment with Pycnoporus sanguineus Murrill CFCC-86183 (15.63%), which was followed by Phanerochaete chrysosporium Burds. CFCC-6676 (15.61%), Pycnoporus cinnabarinus P. Karst. CFCC-89594 (14.50%), A. flavus Link CFCC-84203 (13.61%), Polyporus ciliatus Fr. CFCC-85926 (13.56%), S. columbiense R. Sprague CFCC-85838 (12.68%), B. adusta P. Karst. CFCC-81058 (11.86%), I. lacteus Fr. CFCC-88584 (11.32%), and Phlebia acerina Peck CFCC-84674 (10.42%). Fig. 1. 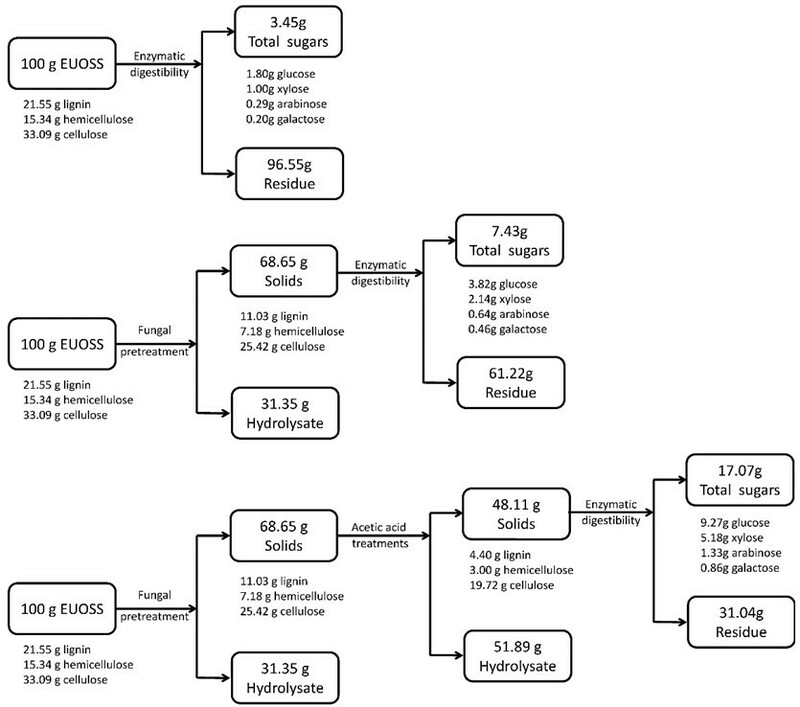 (a) Weight loss (%) of EUOSSs after pre-treatment with nine fungal strains at a moisture content of 74% and 28 °C for 30 d. The weight loss of each strain is shown as the percentage of the original dried material. Data are the mean of three replicates; (b) Remaining lignin, cellulose, and hemicellulose contents (%) in the EUOSSs after pre-treatment with nine fungal strains at a 74% moisture content and 28 °C for 1 month. Data are the mean of three replicates; (c) Lignin loss (%) of EUOSSs after pre-treatment with nine fungal strains at a 74% moisture content and 28 °C for 1 month. Data are the mean of three replicates; (d) Hemicellulose loss (%) of EUOSSs after pre-treatment with nine fungal strains at a 74% moisture content and 28 °C for 1 month. Data are the mean of three replicates; (e) Cellulose loss (%) of EUOSSs after pre-treatment with nine fungal strains at a 74% moisture content and 28 °C for 1 month. Data are the mean of three replicates. The results presented in Fig. 1 demonstrated that the total lignin and hemicellulose contents decreased more sharply than the cellulose contents. This suggested that lignin and hemicellulose were more vulnerable to degradation, which can be attributed to their lower degree of polymerization compared with cellulose. P. chrysosporium Burds. 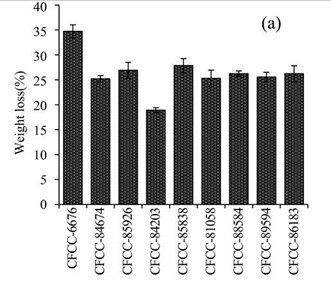 CFCC-6676 exhibited the best total and lignin degradation abilities. According to recent studies (Mosier et al. 2002, 2005; Wyman et al. 2005), the weight losses of seed components is caused by the activities of various extracellular ligninolytic oxidoreductases that are produced by rot fungi, which efficiently facilitates the degradation of lignin in many lignocellulosic materials. Simultaneously, some sugars may be consumed as energy or carbon sources during fungal fermentation. Subsequently, the EUOSSs were pre-treated by the best degrading strain, P. chrysosporium Burds. CFCC-6676, under a solid-state culture at 28 °C and a moisture content of 74% for 7, 14, 21, 28, 35, 42, and 49 d. Following pre-treatment with P. chrysosporium Burds. CFCC-6676, the contents of the EUOSS chemical components were compared and analysed, and the results are displayed in Fig. 2a. The weight losses of the pre-treated samples varied from 3.20% to 38.19% because of the lignin, hemicellulose, and cellulose mass losses. However, the weight losses of the EUOSSs increased in the first 28 d, and then they remained stable with increasing fermentation times. After treatment for 28 d, the weight loss of the EUOSSs was 34.51%. Subsequently, the rate of mass loss decreased, and the maximum weight loss was 38.19% after 49 d of fermentation. Because of the low degradation rate, fungal pre-treatment for a short duration had little effect on the major lignocellulosic contents. 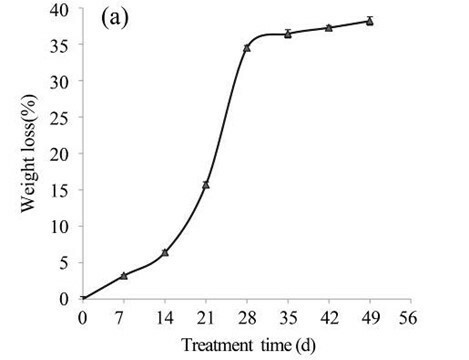 The lignin, hemicellulose, and cellulose in the EUOSS samples after fungal pre-treatment for 7 d decreased by 7.05%, 4.95%, and 2.51%, respectively (Fig. 2b). However, the weight loss of the EUOSSs increased in the first 28 d, and then it remained stable with increasing fermentation time. After 28 d of pre-treatment, the lignin, hemicellulose, and cellulose contents decreased by 48.82%, 53.19%, and 23.18%, respectively (Fig. 2b). Subsequently, the rates of the lignin, hemicellulose, and cellulose losses decreased for fermentation times longer than 28 d.
Fig. 2. (a) Composition of EUOSSs after pre-treatment with P. chrysosporium Burds. CFCC-6676. 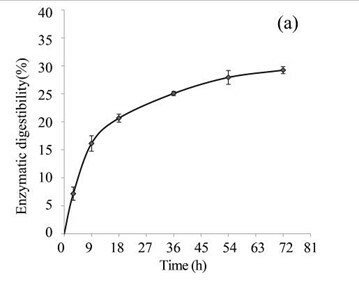 Weight loss is presented as the percentage of the original dry material; (b) Changes of the chemical composition of the EUOSSs before and after pre-treatment with P. chrysosporium Burds. CFCC-6676. Weight loss is presented as the percentage of the original dry material. EUOSSs were pre-treated by the best degrading fungal strain, P. chrysosporium Burds. 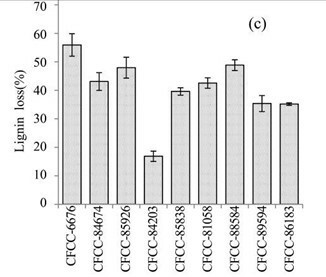 CFCC-6676, under a solid-state culture at 28 °C and a moisture content of 74% for 28 d, and the enzymatic digestibility of the commercial cellulase enzyme preparations containing 15 FPU cellulase per g substratum of pre-treated EUOSSs was analysed at a pH of 5.0 and 50 °C for 72 h (Fig. 3a). The results showed that the maximum enzymatic digestibility was only 29.23% after 72 h. In the initial experiments, cellulose accounted for 25.42 g/100 g dry weight of the initial dry material, the maximum total sugar yield was 7.43 g/100 g dry weight of the initial dry material (Fig. 3a), and the monosaccharide contents were 3.82 g/100 g for glucose, 2.14 g/100 g for xylose, 0.64 g/100 g for arabinose, and 0.46 g/100 g for galactose (Fig. 3b, Table 2). 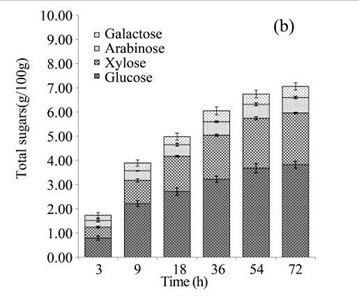 a Outputs of arabinose, galactose, xylose, glucose, and total sugars based on original dry weight. b The EUOSS sample was directly pre-treated enzymatically at a pH of 5.0 and 50 °C for 72 h with a commercial cellulase preparation containing 15 FPU cellulase per g of substratum. c After the EUOSS sample was pre-treated with the best degrading strain, Phanerochaete chrysosporium Burds. CFCC-6676, under a solid-state culture at 28 °C with a moisture content of 74% for 28 d, it was enzymatically digested. d After fungal and acid pre-treatments (2 M acetic acid at 140 °C for 2 h), the EUOSS sample was enzymatically digested. 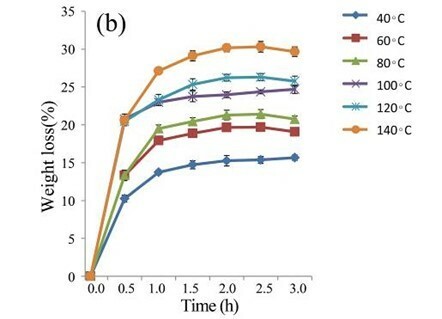 The EUOSSs in the control sample were pre-treated directly with enzymes from a commercial cellulase enzymatic preparation containing 15 FPU cellulase per g substratum at a pH of 5.0 and 50 °C for 72 h, and the results are shown in Fig. 3c. The maximum enzymatic digestibility of the EUOSSs was only 10.43%. In the initial experiments, cellulose accounted for 33.09 g/100 g dry weight of the initial dry material, the maximum total sugar yield was 3.45 g/100 g dry weight of the initial dry material (Fig. 3c), and the glucose, xylose, arabinose, and galactose contents were 1.80, 1.00, 0.29, and 0.20 g/100 g, respectively (Fig. 3d, Table 2). 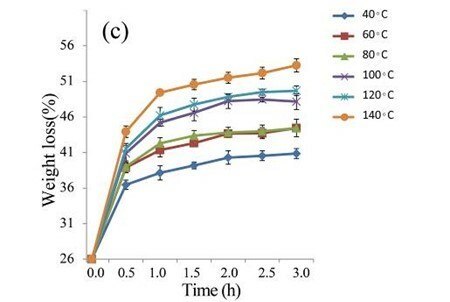 Following pre-treatment with acetic acid, the lignin content of the EUOSSs decreased remarkably, and the enzymatic hydrolysis of the lignocellulosic materials increased. After treatment with various concentrations of acetic acid (0.5 to 3 M) at 40 °C for 0.5 to 3.0 h, the weight loss of the EUOSSs increased as the concentration of acetic acid increased from 0.5 to 3 M for 2 h, and the weight loss of the EUOSSs exhibited small variations when the concentration of acetic acid exceeded 2 M (Fig. 4a). After taking into account both the hydrolysis rate and acetic acid consumption, 2 M acetic acid was adopted for hydrolysing EUOSSs in the subsequent experiments. The EUOSSs were treated with 2 M acetic acid at 40, 60, 80, 100, 120, and 140 °C for 0.5 to 3.0 h (Fig. 4b). At 140 °C, the weight loss of the EUOSS in the control samples was twice as large as that at 40 °C. The weight loss increased slightly as the pre-treatment time increased, and the weight loss of the EUOSSs changed slowly when the acetic acid concentration was increased from 0.5 to 3 M with a 2 h treatment time. The weight loss was 30.17% for the EUOSS pre-treated at 140 °C for 2 h. The EUOSSs were pre-treated by the best degrading strain, P. chrysosporium Burds. CFCC-6676, under a solid-state culture at 28 °C and a moisture content of 74% for 28 d. After pre-treatment, the samples were then treated with 2 M acetic acid at 40, 60, 80, 100, 120, and 140 °C for 0.5 to 3.0 h, and the results are shown in Fig. 4c. After treatment with acetic acid, all of the contents slowly decreased as the temperature increased. The weight loss of the fungal-treated EUOSS samples was 1.7-fold higher than that of the control samples at 140 °C. The weight loss was 51.89% for the EUOSS pre-treated at 140 °C for 2 h.
Fig. 3. (a) Effect of fungal pre-treatment with P. chrysosporium Burds. CFCC-6676 on the enzymatic hydrolysis of EUOSSs; (b) Monosaccharides (glucose, xylose, arabinose, and galactose) in EUOSSs pre-treated with P. chrysosporium Burds. CFCC-6676 after enzymatic hydrolysis. (c) Enzymatic digestibility of EUOSSs. EUOSSs in the control sample were pre-treated directly with enzymes. 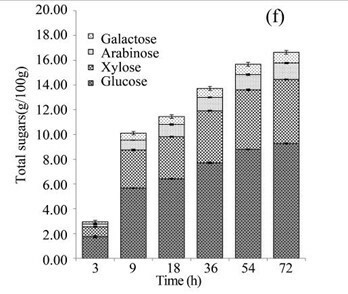 Values indicate the transformation of glucan in the solid residue after pre-treatment; (d) Monosaccharide (glucose, xylose, arabinose, and galactose) contents of EUOSSs that were directly pre-treated enzymatically; (e) Enzymatic digestibility of EUOSSs after fungal and acetic acid pre-treatments. 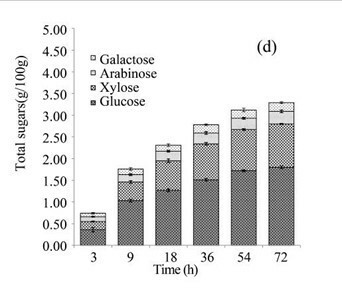 Values indicate the transformation of glucan in the solid residue after pre-treatment; (f) Monosaccharide (glucose, xylose, arabinose, and galactose) contents of EUOSSs after enzymatic hydrolysis following fungal and acetic acid pre-treatments. All values are based on the original dry weight. The weight loss may have been caused by the metabolism of holocellulose by P. chrysosporium Burds. CFCC-6676 during fermentation. Moreover, the extracellular oxidase generated by P. chrysosporium Burds. CFCC-6676 could have degraded the holocellulose in the lignocellulosic materials. The lignin degradation efficiency after multi-pre-treatment was higher than that obtained via a sole biological pre-treatment (Zhao et al. 2008; Martinez et al. 2009). 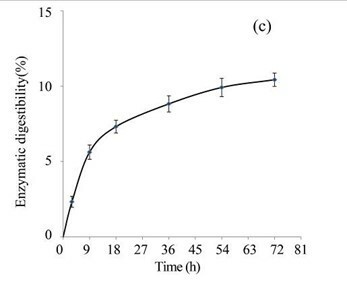 After fungal and acid hydrolysis pre-treatments of the EUOSSs, the enzymatic digestibility was examined at a pH of 5.0 and 50 °C for 3 to 72 h with commercial cellulase enzyme preparations containing 15 FPU cellulase per g of substratum. The results indicated that the maximum enzymatic digestibility of the EUOSSs was 86.56% after 72 h (Fig. 3e). After the acetic acid treatment, the maximum enzymatic digestibility of the EUOSSs was 8-fold higher than that of the fungal pre-treated samples under the same conditions (Figs. 3b and 3e, Table 2). 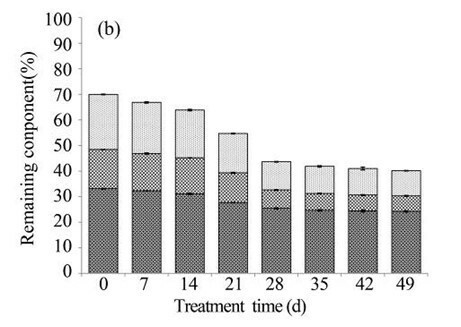 Because of the low degradation rate, a short-duration fungal pre-treatment had little effect on the total sugar yield (Figs. 3e and 3f). The total sugar yield was 3.01 mg/g dry weight of the initial dry material after 3 h. However, when treated for 9 h, the total sugar yield increased, and was 3-fold higher than that treated for 3 h. The yield improved slightly when the pre-treatment time increased. In the initial experiments, cellulose accounted for 19.72 g/100 g dry weight of the initial dry material, the maximum total sugar yield was 17.07 g/100 g dry weight of the initial dry material (Fig. 3e), and the glucose, xylose, arabinose, and galactose contents were 9.27, 5.18, 1.33, and 0.86 g/100 g, respectively, (Fig. 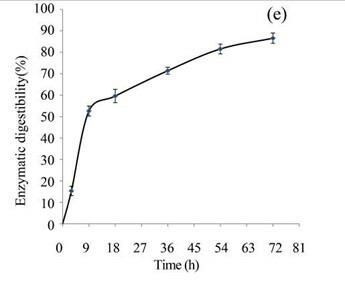 3f, Table 2) after 72 h.
These results indicated that integrating a fungus-assisted pre-treatment with a pre-treatment of hot water or mild acid improved the enzymatic hydrolysis of lignocellulosic biomass. The lignin barrier that protects cellulose could be removed efficiently through co-pre-treatment, which facilitated the access of the cellulases to cellulose. As the lignin content decreased after the fungal-assisted pre-treatment, the pore size in the substratum became enlarged, resulting in greater surface accessibility for the hemicellulase and cellulase (Bak et al. 2009; Zhao et al. 2009; Yu et al. 2011). Figure 5 shows a total mass balance graph based on 100 g of dry biomass. After the EUOSS sample was pre-treated directly with enzymes, the cellulose accounted for 33.09 g/100 g dry weight of the initial dry material, the maximum total sugar yield was 3.45 g/100 g dry weight of the initial dry material, and the glucose, xylose, arabinose, and galactose contents were 1.80, 1.00, 0.29, and 0.20 g/100 g, respectively, after 72 h.
The EUOSS sample was pre-treated with P. chrysosporium Burds. CFCC-6676 and enzymes. The results showed that cellulose accounted for 25.42 g/100 g dry weight of the initial dry material. The maximum total sugar yield was 7.43 g/100 g dry weight of the initial dry material, and the glucose, xylose, arabinose, and galactose contents were 3.82, 2.14, 0.64, and 0.46 g/100 g, respectively, after 72 h.
To provide an overview of the whole procedure of the enzymatic hydrolysis and integrated treatments, the respective contents of the EUOSSs were 33.09 g of cellulose, 15.34 g of hemicellulose, and 21.55 g of lignin before any treatments. Fig. 5. Mass balances after fungal and acetic acid pre-treatments, and the enzymatic digestibility of EUOSSs based on 100 g of the initial dry material. Data are the mean of three replicates. After fungal pre-treatment (P. chrysosporium Burds. 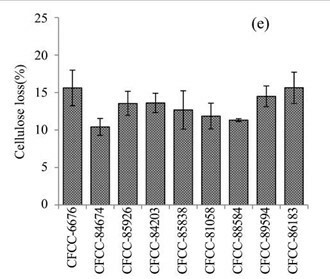 CFCC-6676 under a solid-state culture at 28 °C and a moisture content of 74% for 28 d), the composition changed to 25.42 g of cellulose, 7.18 g of hemicellulose, and 11.03 g of lignin. After the subsequent acetic acid treatment (2 M acetic acid at 140 °C for 2 h), 19.72 g of cellulose remained in the solid residues. The cellulosic residues after pre-treatment were subjected to enzymatic hydrolysis by a preparation composed of 15 FPU/g of cellulase at pH 5.0 and 50 °C for up to 72 h. The maximum total sugar yield was 17.07 g/100 g dry weight of the initial dry material, and the glucose, xylose, arabinose, and galactose contents were 9.27, 5.18, 1.33, and 0.86 g/100 g, respectively, after 72 h.
This study verified that a fungus-assisted pre-treatment of EUOSSs is cost- and energy-effective, and it is active over a wide temperature range. EUOSSs were pre-treated by nine fungal strains, and P. chrysosporium Burds. 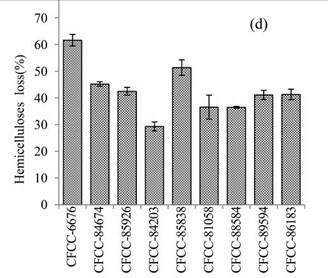 CFCC-6676 exhibited the best total and lignin degradation abilities. After being pre-treated by P. chrysosporium Burds. CFCC-6676, the weight loss of the EUOSSs was 34.51%. The fungal and acetic acid pre-treatments improved the enzymatic hydrolysis efficiency of the EUOSSs. When EUOSS was directly pre-treated at 50 °C and pH 5.0 for 72 h with 15 FPU commercial cellulase per g of substratum, the maximum enzymatic digestibility was only 10.43%. However, when the samples were pre-treated with P. chrysosporium Burds. CFCC-6676, the enzymatic digestibility was 29.23%. By combining the fungal and acetic acid pre-treatments, the maximum enzymatic digestibility was greater than 85%. Therefore, the integrated treatments greatly enhanced the enzymatic digestibility of the EUOSSs. The enzymatic digestibility of the fungal and acetic acid pre-treated EUOSS samples was remarkably higher than that of the direct enzymatic pre-treatments and fungal treatment alone. Therefore, the method developed here is an environmentally friendly and effective method for degrading lignocellulosic materials in EUOSSs. Based on the increased digestibility of EUOSSs, Phanerochaete chrysosporium is an appropriate strain for the biological pre-treatment of EUOSSs. After combined pre-treatment with Phanerochaete chrysosporium Burds. and acetic acid, the weight loss of the EUOSSs was 51.89%. Furthermore, the synergistic effects of the chemical and fungal pre-treatments resulted in an enzymatic digestibility of 86.56%. Hence, a fungus-based, acetic acid pre-treatment, combined with enzymatic hydrolysis, of EUOSSs is a cost-effective and feasible strategy for reducing the energy consumption and pre-treatment time for the bioconversion of lignocellulosic materials. This work was ﬁnancially supported by the National Natural Science Foundation of China (project no. 31560192), the Youth Science Funds (project no. 31100421), the Natural Science Foundation of Hunan Province (project no. 13JJB011), the Science and Technology Project of the Key Laboratory for Ecotourism of Hunan Province (project no. JSSTLY1516), and the JSPS Invitation Fellowships for Research in Japan of the Japan Society for the Promotion of Science (long-term project no. L15711). Anderson, W. R. (1982). “Review: An integrated system of classification of flowering plants,” Brittonia 34(2), 268-270. 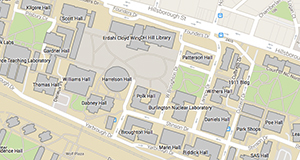 Du, H.-y., Du, L.-y., and Li, F.-d. (2004). “Dynamic of gutta-percha formation and accumulation in Samara of Eucommia ulmoides,” Forest Research – Chinese Academy of Forestry 17, 185-191. Ji, Z., and Su, Y. (2006). “Effects of planting modes on secondary metabolite contents in Eucommia ulmoides barks,” Acta Botanica Boreali-Occidentalia Sinica 26(9), 1911-1915. Kuhad, R. C., Singh, A., and Eriksson, K.-E. L. (1997). “Microorganisms and enzymes involved in the degradation of plant fiber cell walls,” in: Biotechnology in the Pulp and Paper Industry, K.-E. L. Eriksson (ed. ), Springer-Verlag, Berlin, Germany, pp. 45-125. Morton, M. (2013). Rubber Technology, Springer Science & Business Media, Berlin, Germany. Ouyang, H., Yu, J., Li, J.-H., and Zhang, Y.-K. (2009). “Extaraction of rubber from the seed shells of Eucommia ulmoides,” Journal of Northwest Forestry University 24(4), 160-162. Peng, W., Wang, L., Ohkoshi, M., and Zhang, M. (2015). “Separation of hemicelluloses from Eucalyptus species: Investigating the residue after alkaline treatment,” Cell. Chem. Technol. 49(9-10), 756-764. Ruifang, Y. (1995). “Prospects and research progress on Eucommia ulmoides Gum,” Progress in Chemistry 7(1), 65-71. Sluiter, A., Hames, B., Ruiz, R., Scarlata, C., Sluiter, J., Templeton, D., and Crocker, D. (2012). Determination of Structural Carbohydrates and Lignin in Biomass (NREL/TP-510e42618), National Renewable Energy Laboratory, Golden, CO.
Sluiter, A., Hames, B., Ruiz, R., Scarlata, C., Sluiter, J., and Templeton, D. (2008). Determination of Ash in Biomass (NREL/TP-510-42622), National Renewable Energy Laboratory, Golden, CO.
Wang, L., Luo, Z., Xiu, S., and Shahbazi, A. (2011). “Pretreatment and fractionation of wheat straw with acetic acid to enhance enzymatic hydrolysis and ethanol fermentation,” Energy Source. 33(13), 1230-1238. Article submitted: April 14, 2017; Peer review completed: June 1, 2017; Revised version received: June 4, 2017; Accepted: June 12, 2017; Published: June 19, 2017.